← Thinking about plant bug control in cotton? They’re back, but they don’t scare me! It is very unusual to see economic damage from Japanese beetles in cotton, soybean, or corn. They may cause defoliation in all crops. I’ve never seen enough defoliation in cotton or corn to justify treatment. On a few occasions, I’ve seen enough defoliation in soybean to catch my attention. They will hang around for a while, so in combination with other defoliators, they may cause enough damage to justify treatment. Treatment for Japanese beetle in soybean is not recommended unless defoliation exceeds 30% prior to flowering and 20% once flowering has begun. 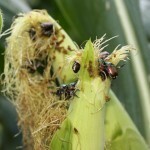 In corn, Japanese beetle are attracted to silks and silk feeding causes some concern. However, we’ve done substantial research which indicates this only affects pollination and yield under conditions of drought stress and when infestations levels are high. The currently recommended treatment threshold is an average of 3 beetles per ear, something rarely observed except on field edges. 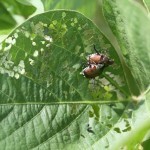 A good publication about the common defoliating beetles found in soybean is available at http://utcrops.com/soybean/soybean_insects/SoybeanBeetles.htm. See below for a photo gallery of Japanese beetles and their feeding injury. Pyrethroid insecticides are generally used to control Japanese beetles, but those that grow roses and many other ornamental plants already know that beetles sometimes re-infest fields within a few days.